If you are a parent on insulin or certain tablets for type 2 diabetes, it is relatively likely that you may experience low blood sugar levels when your children are around. This guide is about how to explain hypos to your children, how and when they can help you as well as how to deal with a situation in which you have a more severe hypo in front of your children. Children can be life savers too and it is not uncommon for even young children to recognise when a parent is having a hypo and bring glucose tablets or call for an ambulance. It is therefore a good idea to tell your children about hypos and how they may be able to help. Children from primary school age should be at a good age to be able to help you should you need help. 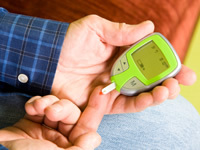 You may want to explain that your diabetes may make you feel poorly. As an analogy, you may want to say that it’s like being a car that has run out of petrol. You need to have glucose to get you back to normal. You can let them that if you’re behaving a bit differently to normal, it could be down to your diabetes. It’s a good idea to point out to your children when a hypo is more serious and what they can do to help. You may say that if you are having trouble talking to bring you your glucose tablets. It’s a good idea to keep glucose tablets available so your child can easily grab these for you if needed. You may need to tell them that they’re your medicine and that they shouldn’t eat them. It is also a good idea to let them know how to call for an ambulance and when to do this. You may say if you won’t wake up during the day to call 999 and say an ambulance is needed because Mummy/Daddy is diabetic and hypo. A number of the symptoms of hypos may be embarrassing. Once you have started to recover, it’s important to try and maintain composure even if you feel embarrassed. Hypos do happen so don’t beat yourself up but also try not to be overly defensive over what has happened if you can. Your children may be surprised the first time they see the signs of a hypo and, depending on severity of the hypo, it could be scary. It is common for people who don’t have diabetes to view someone with diabetes having a hypo as unnerving to see. It can be difficult to see someone lose control and begin to behave irrationally. Some people may find it scary and difficult to deal with. In children, this may be amplified and it’s important to offer reassurance to your children, when you have fully recovered, if they see you having a more severe hypo. If others are present, it can make the situation more difficult. As hard as it may sound, it’s important to stay as calm as you can and trust others, whether they’re your partner, family or members of the public. We can have a slightly distorted view of reality when low on sugar so it is important to try and cooperate as best you can with other adults who may be present. It is often better to save explanations for when you get back to having a good blood glucose level again. Reassuring yourself It’s also important to think of yourself as well. Try to learn from the experience but don’t overly beat yourself up. Focus on which positive actions you can take to reduce the chances of a hypo taking place in future. Hypos are much more likely to strike out of the blue if you have lost awareness of your hypo signs. Loss of hypo awareness tends to occur if you your body spends too much time, or is too often, in a state of low blood sugar. Awareness of hypo symptoms can often be restored if you keep your blood glucose levels consistently above 4 mmol/L for a number of weeks. Read more on hypo awareness.